1. Please remember horses always have the right-of-way. 2. Leave one ear free from headphones so you can hear horses approaching. 3. Don’t run up on a horse, especially from behind. Surprised horses can injure you or their riders. 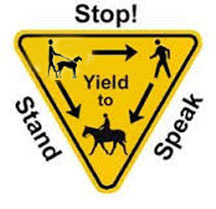 Slow down to a walk and speak up to alert the horse and rider that you are there. 4. To pass a horse: Call ahead and make yourself known to the rider. Ask if it is OK to pass and best way to do so. Walk by steadily only after the rider gives you the go ahead. 5. To allow a horse to pass you: Step to the side of the trail, remain visible and speak to the rider and horse in a friendly tone. The sound of your voice will help the horse understand that you are a human, not a predator. 6. DOGS MUST ALWAYS BE ON A LEASH AND UNDER CONTROL. When meeting a horse, take your dog to the side of the trail, and remain visible and within the horse's sight at all times. Communicate with the rider. If you encounter someone with their dog off leash or riding a bicycle, please report it here.